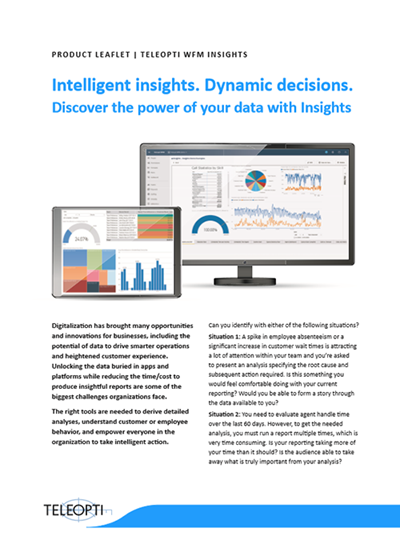 Insights helps companies discover the power of their data and transform their operations with analysis at the speed of thought. Harnessing cloud-based Microsoft Power BI, Insights offers dynamic, interactive reporting so that both users and management can be empowered with engaging, clear visualizations, derive intelligent insights and make dynamic decisions. Download this product leaflet to learn more about the potential for business and functionality for users. Looking to keep your WFM on premise? While Insights is Teleopti's Cloud BI solution, there is also an extensive Teleopti WFM suite that can be installed and operated from your in-house servers and computing infrastructure. Learn more about our on-premise reporting tool, Performance Manager.